At home in the wild, African lions are among the most formidable animals on the planet - both feared for their cunning as predators, and revered for their power and natural beauty. But when locked behind glass as living displays, it's all too easy to forget what makes them so regal. Footage has emerged which captures that sad fact better than most. 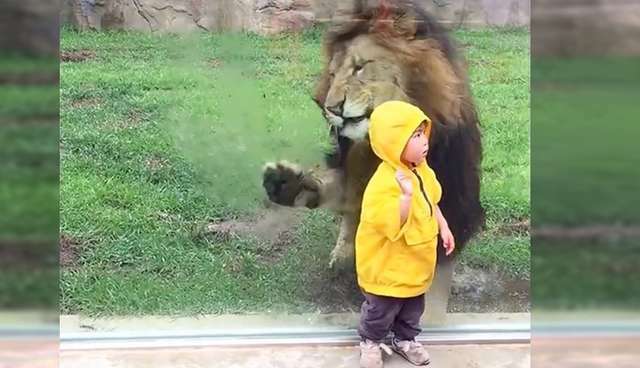 Filmed at Japan's Chiba Zoological Park, the brief clip shows the moment a lion slams headfirst into his enclosure glass after being provoked into pouncing by a small child staring at him from the opposite side. Some local media reports on the incident have described the lion's actions as playful, but the speed and ferocity of his movements suggest he intended to give more than a gentle pawing. "Lions are natural wild predators and the child in this video, especially when turning his back to the massive feline, becomes prey in the animal's eyes," Adam M. Roberts, CEO of Born Free USA, told The Dodo. "The firm glass wall held the lion inside his enclosure, surely frustrating his innate instincts. But luckily for the family, if the barrier had not held the consequences could have been catastrophic." While it doesn't appear that the captive big cat was injured in the collision, he's still at risk of other sorts of maladies. Despite being fixtures at zoos around the world, lions, like many wide-ranging carnivores, fare poorly in captivity and often exhibit signs of stress and mental deterioration. Though I hoped to find evidence to the contrary, I must conclude that zoos continue to be detrimental to animal welfare, and that they do not teach children positive lessons about animals. Kids who watch leopards pacing in mindless patterns get a completely inaccurate picture of what large predators are all about. They also learn that making sentient beings suffer for human amusement is acceptable. We want to teach kids to show kindness towards animals, not stare at their misery while eating popcorn. This conclusion, particularly in light of the recent death of Harambe the gorilla, who was killed after an overly curious child fell into his enclosure, should have parents rethinking their next visit to the zoo - for the sake of children and animals alike.